Bedlam’s latest production, Uncle Romeo Vanya Juliet, described in the show’s publicity as a mash-up of Uncle Vanya and Romeo and Juliet, takes a different approach. Rather than burrowing into the separate plays for new subtextual insights, the adaptation by Kimberly Pau looks outside of the texts for inspiration. The dramaturgical merging attempts to show how the classic works complement each other through their über-textual parallels. The final result, unfortunately, is as ungainly as the show’s title. The production ultimately numbs Chekhov’s aching anguish and neuters Shakespeare’s romantic poetry. Susannah Millonzi as Sonya and Eric Tucker as Astrov in Kimberly Pau’s Uncle Romeo Vanya Juliet. Top: Zuzanna Szadkowski as Yelena/Juliet and Edmund Lewis as Vanya/Romeo. Actually, the mash-up designation is rather misleading. While one might expect this appellation to be a classical cocktail mixed with equal parts Vanya and equal parts Romeo and Juliet, the primary focus is essentially on the former. Pau has provided a script that is a generally faithful version of Chekhov’s play with just two eliminated characters (Vanya’s mother and Sonya’s former nanny), but the rest of the existentially afflicted individuals are all present. For the first two thirds of Uncle Romeo Vanya Juliet, directed by Eric Tucker, audiences can expect a fairly straightforward interpretation of Chekhov’s masterwork. For those unfamiliar with the plot, the lives of Vanya (Edmund Lewis) and Sonya (Susannah Millonzi) are thrown into turmoil with the arrival of Sonya’s father and pedantic professor, Serebryakov (Randolph Curtis Rand), and his young wife, Yelena (Zuzanna Szadkowski). Astrov (Tucker), the neighboring doctor and dabbler in botany, has become a permanent fixture in the home, and his passionate love for Yelena wreaks emotional havoc on the household. Vanya also loves Yelena, and both Sonya and Yelena love Astrov, and although no one dies as a result of star-crossed passions, their fates are even worse: except for the haughty professor, the characters will presumably live in eternal misery and loneliness. Tucker and Szadkowski. Photographs by Ashley Garrett. The Romeo and Juliet tangents offer little in the way of emotional or intellectual illumination. At times, there are moments of cleverness, such as in a reference to Vanya’s dream. This prompts Astrov to metamorphose into Mercutio and recite his well-known Queen Mab monologue. There is also an extended riff late in the play in which Vanya fantasizes about killing Serebryakov, and the characters assume an alternative reality. Vanya/Romeo and Yelena/Juliet are romantically tragic in ways that undercuts the quotidian tragedy that Chekhov presents. 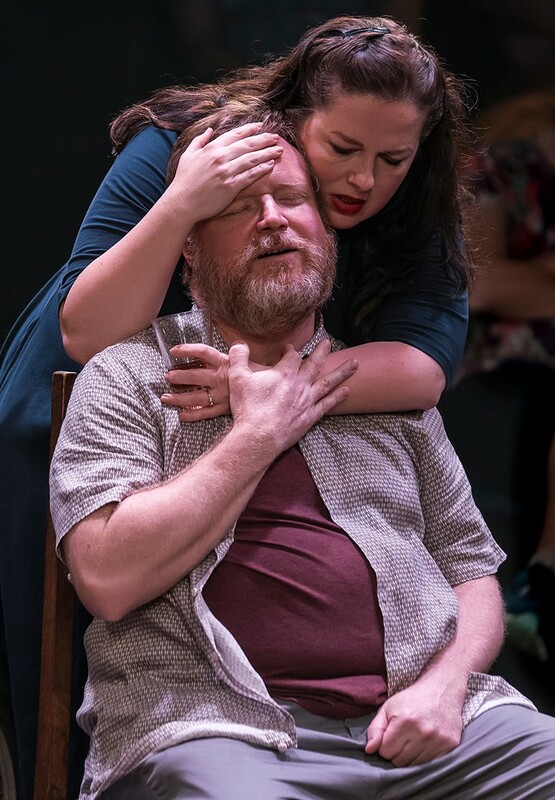 If the amalgamation does not effectively serve Chekhov’s and Shakespeare’s works, the five-member ensemble (with an on-stage musician, John Coyne, who masterfully accompanies the cast in periodic Russian folksongs) tears into the material. Alternating between rough-and-tumble acting and broad comedy, each actor also has quiet moments to show the sense of solitude just under the surface. Les Dickert’s impressive lighting (with a special nod to the birch trees with red fairy lights) and Charlotte Palmer-Lane’s mix of contemporary and period-inflected costumes (including putting Yelena/Juliet in a white wedding dress for most of the second act) provide a waking dreamlike quality to the proceedings. Chekhov purists might be more inclined to see the current production of Uncle Vanya across town at Hunter College. Richard Nelson’s spare, quiet production seems more radical in its simplicity. The Bedlam production needlessly and regrettably complicates the play with its infusion of dramatic schizophrenia. Uncle Romeo Vanya Juliet plays through Oct. 28 at A.R.T./New York Theatres Mezzanine Theatre, 502 W. 53rd St. Evening performances are at 7 p.m. Tuesday and Thursday through Saturday; matinees are at 2 p.m. Wednesday, Saturday and Sunday. For a performance calendar and tickets, visit bedlam.org.